Movie Review: Invictus | Through the Looking Glass.. I would like to assert right in the beginning that I am a true admirer of movies like Jo jeeta wohi sikandar and Lagaan and I am a true detester of films like Goal. Films about sports have been one of the most successful genres of film making in every film industry. Haven’t we all cherished films like The babe, Million dollar baby and Ali? From the promos and publicity done for Invictus, it does come across as a sports film. However, I would like to look at it as a socio-political drama which has been treated in an invigorating way using Rugby as a central theme. In today’s world, where being innovative and thinking out of the box is given such massive importance in every industry, here is a story of a man who thought in a staggeringly different way to establish harmony in a society which was jaundiced by Apartheid way back in 1995. Nelson Mandela, the first president of the democratic South Africa, was an anti-Apartheid activist and had served 27 years in prison charged with leading a movement against racial discrimination. After his appointment as the President, out of the many challenges he had at stake like a State to run, an economy to stabilize the biggest was to build a state of brotherhood amidst its citizens. 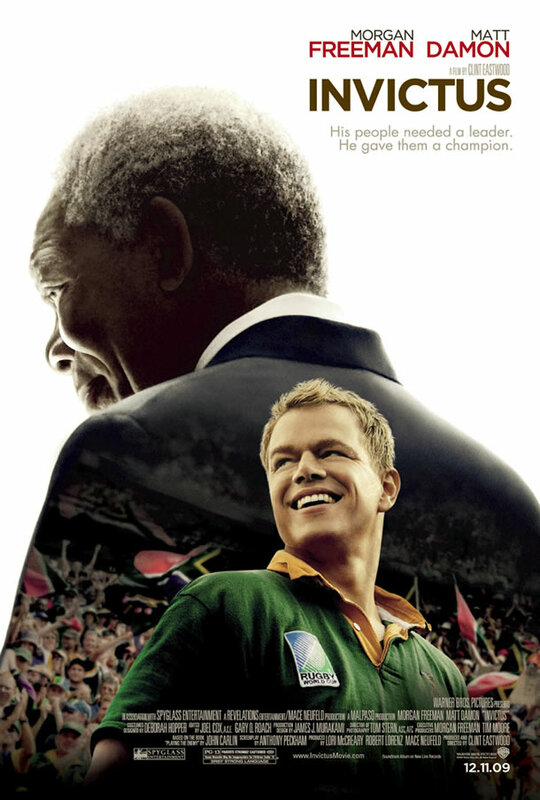 The story of Invictus starts at the point in Mandela’s life when he takes charge as the President. South Africa’s Rugby team Springbok was predominantly supported by the Whites and was hated by the Blacks. Mandela saw an opportunity in this sport as the Rugby World Cup was right at the anvil. His thought was to eliminate the racial divide that was persistent in South Africa and that had put forth its ugly head in every sphere of life by projecting Springbok as a national team as opposed to the contrived notion of it being a symbol of racial oppression. He publicized Springbok as the team that represents South Africa on the whole and not just the White population of the country and infused this notion in every team member. Victory of Springbok would mean victory of South Africa and only that could establish an emotion of oneness. Morgan Freeman undoubtedly is the best choice for the lead role of Mandela. He is one of those actors who can breathe every character he plays. I cannot imagine anyone else portraying Mandela’s character with such penchant on screen. Clint Eastwood yet again showcases his cinematic genius with the perfect choice of actors and a strong screenplay which only exhilarates the viewing experience. Matt Damon who plays the role of the captain of the Springbok team puts forth a highly leveled performance. The authenticity of the script is seen in the dialect in which both Freeman and Damon speak. There are some dialogues which are truly fantastic, brevity being the biggest pro. For instance, the day before the final match, Matt Damon thinks to himself – “He could forgive those who imprisoned him for thirty years”. However, I feel that the film is a tad too swiftly paced. It lacks the dramatic luster at places where it deserves to have it almost inevitably. The whole process of convincing every team member to overcome their dogmatic opinions about the Black population has not been shown to be a great deal of struggle. Also, the last few minutes of the match are stretched sequences which mar the excitement that is built since the beginning of the final game. I think for a film like Invictus, the biggest challenge is to be able to hold viewer’s interest in spite of the fact that it is evidently known who the winner is at the end of the game. To a large extent, Eastwood has been successful in doing so. On the whole, the strong performances of Morgan Freeman and Matt Damon overshadow the lack of drama and the film comes across as a truly soul stirring presentation of a visionary’s life, not being a mere documentation of a series of events in Mandela’s life. Invictus, which means unconquered, is a poem by Willian Henley which I remember reading as a part of my English curriculum in school. This poem plays a rather crucial part in the climax of the story which justifies the name of the film. I would surely recommend this film to all those who want a breath of fresh air. Watch it for a mind blowing performance by Morgan Freeman and the unconventional backdrop of a story which is seemingly predictable but is immensely engaging. Sounds like a good movie, will definitely watch! //I wish the 🙂 would smile a leeettle more//–yeah right.. wordpress is far better than the smiley-less blogger! It still hasn’t released in India!! Can’t wait to watch morgan freeman. Do watch it once its out. I am sure you’ll like it..
One of my favorite sports movies, would be Chak De. I loved it despite SRK. The song Chak De India, makes patriotic emotions rise in every Indian’s heart, unfailingly, each time he/she hears it. Good post, I didn’t know what the movie was about, and the name didn’t help me understand either. Will make it a point to see it now though. //I loved it despite SRK.//– 😆 True. Chak De! is one film in which it is the rest of the characters which overshadow SRK. //patriotic emotions rise in every Indian’s heart//–Well put. I dont know about patriotism, but i guess, oneness is what surely comes up..
//Will make it a point to see it now though//–Cool! Hope you like the film.. Do let me know how you found it..